Towing someone on a water ski isn’t just a matter of taking off and hoping they hold on. Nope, there is an art to making sure you’re mate dangling out back is safe, and other people on the water are too. Before you head out, we highly recommend checking out the regulations for your state or territory. Google ‘water skiing’ and the name of your state, and you’ll find the Department of Transport website with the relevant regulations. For example, in Queensland, water skiing can only happen in an anti-clockwise direction (unless signage says otherwise), and your observer must be aged 13 years of more. These simple rules will help you stay safe, and they’re vital to know, wherever you venture. But now, let’s talk about safe water skiing. Is your gear in working order? They will either check over your gear for you, or refer you to a professional who knows what they are doing. It’s vital that your gear is in safe working order before you even launch your boat (and then your skier). Different water skiing spots have different rules relating to safe skiing. As we mentioned earlier, check the regulations in your state, and either print them out or store them on your phone for future reference. What direction you should be traveling (clockwise or anti-clockwise). Any other rules relating to right of way on the water. Never head out on the water without this basic information. Okay, so your gear is in working order, and you know what rules apply to your location of choice. If you’re towing for the first time, we always recommend choosing a lake or river, as it is easier to spot your skier if they fall, and the water is less choppy. We also highly recommend heading out at a time when there aren’t many people on the water, that way you have fewer obstacles to think about. If you’re a beginner, you should always take an experienced tower with you, so they can offer you tips and take over if necessary. The best way to learn any skill is by doing, but only under controlled conditions (as controlled as they can be on the water), and under the guidance of an experienced person. How do I actually tow a water-skier? When your water skier is in the water, your boat’s engine must be switched off completely. This means no idling, and this applies no matter what kind of boat you have. Your skier will then swim to where the line is taut, or once they are a few metres away from the boat, you can idle away until the line is taut. Now, give the boat a bit of power, but only enough to pull the skier to the water’s surface. Your speed should be minimal – as in, just enough to get them on their feet. Then maintain this speed for a short period of time, before slowly increasing it. Gunning the boat is likely to pull the line from the skier or unbalance them, which means they’ll probably fall. It’s also very unsafe, so keep your speed minimal. When you do increase your speed, do so smoothly and incrementally, and never exceed regulation speed limits. If you want to perform a smooth, comfortable and safe turn, tracing the shape of a basic keyhole is the best way to achieve this. How does this work? Well, before you turn right, make a small turn left, then make a slow, long arc right. When you’re in charge of driving a boat, you need to be aware of other obstacles and people on the water, as well as the person you’re towing. This is a lot to take in, which is why you need an additional person onboard to observe the water skier at all times. Of course, if you’re starting out. We recommend having an observer, as well as someone to support you with driving the boat safely. Your observer will tell you if your skier has fallen in, or if anything changes. Most states have a minimum age requirement for observers, so be sure to check this before heading out. If you’re not sure where to start, this PDF from the Queensland Department of Transport offers some good hand signal suggestions, which will hold you in good stead. Make sure to understand and practice them before you head out on the water so they are second nature. Never tow a water skier too close to the shoreline, other boats or, well, any obstacle at all. A good rule of thumb is to keep your skier double the length of the rope he or she is using, away from boats, the shore and anything else. 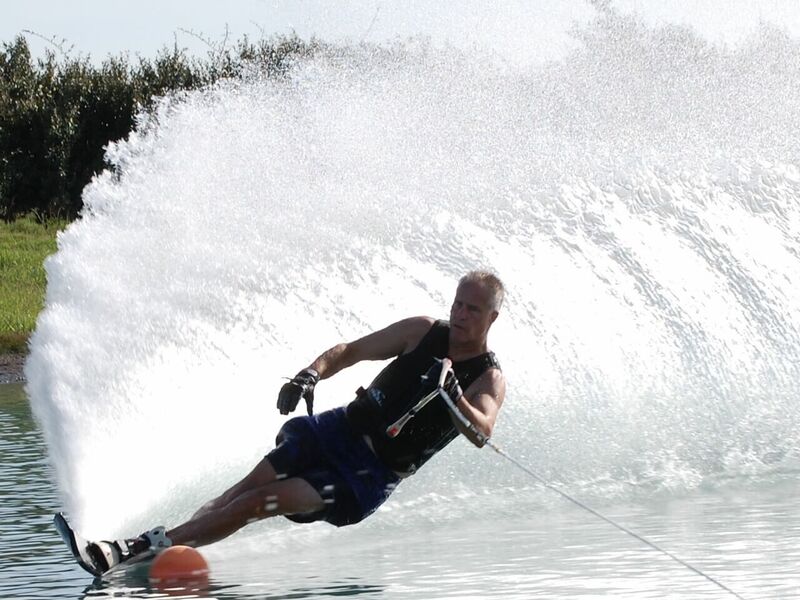 For example, if the water skier’s rope is 70 feet long, stay at least 140 feet from the shore and other obstacles. Learning a new skill takes time and practice, but once you’ve mastered the art of towing, you’ll end up having loads of fun taking your friends out on the water. If you need insurance for your boat, we offer comprehensive cover for most kinds of vessels, just in case the unforeseeable happens. Having good cover will give you peace of mind when you’re out on the water. Contact us for a free quote and stay safe out there. Disclaimer: This information is purely a guide, and should not be relied on completely. Always seek the instruction of a professional before towing a water ski to ensure you, your water skier and members of the public are safe.